Gunung Ranai is the highest peak of Natuna Besar island, a remote island in the South China Sea between Borneo and the mainland Malaysian peninsula. Ranai is simultaneously the most isolated Ribu on the list, but also the Ribu closest to an airport (although Cyclops near Sentani airport in Papua must be a very close second). So, whilst it looks isolated on a map (many might assume it to be part of Malaysia) there are actually daily flights to/from Batam therefore getting there is not so difficult. The airport and town are both named after the mountain itself. Despite several reports of ‘expeditions’ to the mountain, the usual hike is very straightforward but only leads to Serendit, the third-highest and most south-eastern of the three peaks on the summit ridge. There are three peaks on the mountain, each with high cliffs – Serendit (968m), Erik Samali (999m) and finally Datuk Husin (1,035m) all of which are separated by several hundred metres of dense forest. From Serendit in the south-east to Datuk Husin in the north-west it is about 2 kilometres, but there is no trail at the moment. The trail to Serendit is remarkably well-defined and popular with local schoolkids during the weekend. The starting point is at Ranai Darat, at the end of a road which leads up between boulders and odd military signs and reaches an elevation of around 130m. It takes just over one hour to walk there from the centre of Ranai town or about 5 minutes on a motorbike! Follow the sign for the ‘air terjun’ (waterfall) as it leads over a bridge and past a house with loads of upturned beer cans (including the delightful Tiger beer from Singapore) and to a second sign with Gunung Ranai also mentioned. Just beyond here you will be able to gaze down to the right and see the eastern coastline and the enormous new mosque complex started in 2007 and still unfinished. The path continues to rise gently. After an official but uninformative forest sign the trail enters proper forest. Watch out for leeches – you will probably meet one or two. At an elevation of 300m the trail divides – left for the waterfall and right up the hillside to the summit ridge of Ranai itself. It’s a good idea to visit the waterfall on your return. The mountain trail gets progressively steeper but it is pretty straightforward for the most part. Given its isolation, it is not surprising that there is some fascinating flora and fauna to be spotted on Natuna Besar. At an elevation of between 600 and 700 metres there is a large population of small, bright red terrestrial crabs. Richard Hartnoll, a crab expert based in the UK, says that it is ‘a species of Geosesarma, a genus of small crabs which lives in fresh water or on land. Unlike the larger and better known ‘land crabs’, such as the ones on Christmas Island, it does not have to return to the sea to breed. It has suppressed the larval stage, and the eggs develop direct to small crabs.’ On seeing photos of these crabs, Richard put me in touch with Singapore-based Peter Ng who confirms that the bright red Ranai crab ‘is a new species that has no name. Some 7-8 years ago, several of my museum folks with an Indonesian student then did a study of the islands land and freshwater crabs and we collected many samples. Including this new species.’ Fascinating stuff. After the final steep section, during which you will need to use your hands, a small clearing (900m) on the mountain ridge is reached. It should have taken you no more than 3 hours to reach from the trailhead or 4 and a half from the centre of Ranai town. It’s a perfect place for a short rest and home to a large number of the pitcher plant species Nepenthes ampullaria which is ‘a fairly widespread species in the Malay peninsular and on Borneo, though it also grows on Sumatra, parts of Maluku and New Guinea’ according to Nepenthes expert Alastair Robinson. Make sure you take some photos – there are hundreds clustered together just a few metres to the north of the clearing. If you are exceptionally lucky you may meet a Kekah, an exceptionally endangered primate that is only to be found in the Natuna islands and which looks as if it is wearing glasses! On the other side, to the south/south-east, in fine weather you will see some very imposing vertical slabs of granite. This is the third-highest peak of the mountain, known as Serendit/Srindit Peak. It is just a ten minute scramble around and through the rocks to get up there, but there are lots of huge gaps between rocks so the utmost care is needed here. Once you have weaved your way through the bottom of the rock-face (crawling required! ), some sections of the trail are very steep and there is even a little roped section but most fit hikers should be able to get up onto the top of the rocks. A large Indonesian flag is draped around a cluster of boulders and hiking clubs have left signs and/or written their names into the stone. The views from here are lovely – out to the small island of Senua and over the town itself. You may even see one or two hornbills flying over the forest below. It’s a vertical cliff-face that some rock climbers have climbed up/down (you can see the metal attachments in the rocks) in the past so take real care not to go too close to the edge. This is what the vast majority of hikers regard as being the top of Ranai, but it’s only about 950m elevation. Indeed, you surely will have noticed that this is not even the highest point of Serendit Peak. There are two large boulders to the north of the markers and one of those is the 968m point. And it’s not accessible for ordinary hikers. After enjoying the view it is a straightforward 2-hour hike back down. The waterfall is worth a visit, especially as it is very quiet and only a ten-minute detour. With regard to the two higher peaks of the mountain, we heard reports that there may be a second trail (though presumably rather rough) from the northern end at Desa Ceruk near Desa Lima Manis. However, we also heard that there are landslides in this area which may have made any trail impassable. There is no guarantee of a trail to the true peak (northwestern top) (1,035m) but it may be worth a try if you have extra time to explore. You are advised to ask for ‘Gunung Ceruk’. A great place to sit and gaze at the mountain is Alif Stone Park, about 7km north of Ranai town. It’s a collection of beautiful, natural granite boulders on the beach, with basic wooden planks connecting them to the shore. 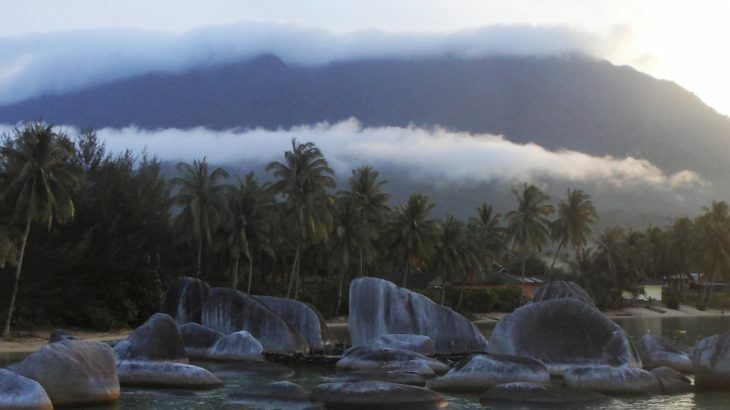 The boulders are of the same sort as those found on Bangka and Belitung and the location is well worth visiting at dusk for photographs. 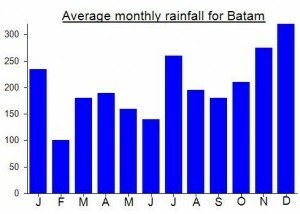 Getting there: There are flights from Batam twice a day (except Sundays). The mountain is less than 5km from the airport. Accommodation: Several hotels in town. Penginapan Central is fine. Simple accommodation also available at Alif Stone Park. Permits: Not necessary. Foreigners should expect to have to show their passport/ID cards on arrival at the airport. Water sources: Available at the waterfall (300m) and at ‘Air Dingin’ (800m). Kepulauan Riau Kurang Tinggi. permalink. Thank you for this account. And thanks to the one you wrote on Belitung (Gunung Tajam), I was able to make it to the top of Gunung Tajam. With not much time on my hands, luck was on my side for we encountered a group of guys on motorbikes who was repairing the road to the summit. They gave us rides all the way to the top where the TVRI station was. Perhaps it was cheating but my point was not to hike on foot to the top. I will be contacting you about the mountains on Natuna. Thanks again. Basically the Dutch already have some sort of contract in the early 20th century with the Sultanate of Lingga covering the island. However, the Malaysian source indicated that prior to 1824 agreement between the British and the Dutch, Natuna was under the rule of Johor Sultanate and it is possible that the Dutch was actually supposed to be restricted to islands south of Singapore. The Malaysian article also noted a large cultural similarity and that the language spoken is very close to the Terengganu dialect in Malaysia. So it is possible that Indonesia simply declared it earlier and with Malaya not bringing up the issue at all it become a rightful part of Indonesia. Great little climb on this most remote island at the southern tip of the South China Sea (apparently not disputed by neighboring counties). More time needed to explore a route to the highest peak. The economy of Natuna seems to be based on the export of traditional products such as fish, copra, etc. Pete, a bean produced by a tall, leguminous tree that grows wild in the forests, is one of its renowned exports. The Province of Riau, to which Natuna belongs, is one of the richest in the whole of Indonesia (oil, gas, timber, Batam). Also, because of its strategic importance, Natuna presumably receives a heavy subsidy from the central and provincial governments. One such example is the enormous Islamic centre and mosque complex, to which Dan has referred. The mosque is indeed an extremely beautiful work of architecture. But – another ‘white elephant’? Could the millions of dollars be better allocated for health and education or for infrastructure in the poorer parts of Indonesia? I had been looking forward to this one for quite a while for what I imagined would be an easy ‘bag’. As you’ll read above, it wasn’t quite the case but the hike itself was lovely. We had a lot of grey weather but the skies cleared a little as we reached the top of the Serendit/Srindit Peak. Strangely, nobody at our hotel (the very reasonable Penginapan Central – 200,000 standard, 350,000 for hot water) could find a friend who knew the way up the mountain but a friendly local man Buyung (HP 0812 70099992) gave us directions and then met us the following morning just after dawn as we walked up Jl Putri-Bungsu to the trailhead from the town in search of a local person to lead us up the mountain. The very pleasant Pak Bakrie sent his son Zulfikar with us but to be honest the trail is one of the most obvious (and most well-signposted on the lower slopes) that a guide is barely necessary, especially as there are bright red ribbons tied to trees too. Local kids were climbing also. There are quite a lot of mosquitoes so best wear long trouser and shirt sleeves. Nick said the fabulous cliffs of Serendit Peak reminded him of the film ‘Picnic at Hanging Rock’. In better weather it’d be a great place to relax for a couple of hours – not dissimilar in height and views to West Java’s Parang and Bongkok. We didn’t see the Kekah but our guide spotted a yellow and red frog (unfortunately we didn’t get a photo). The local people were very keen to chat as very few foreign tourists visit the island. The oil and gas areas are a considerable distance away on other islands. We spent a fair bit of time watching the chap making complex fruit juice concoctions on the main street. The majority of the restaurants are Padang food. Every second shop seemed to be a hairdressers! The availability of Tiger beer was a most welcome surprise! A special local fruit is the tiny Kesturi orange. After enough Padang food for the weekend, and given that you have to change in Batam, we went for an all-day breakfast at the delightfully named Lucy’s Oar House in Nagoya! An excellent weekend but given how far north the island is, the seasons appear to be switched round (when it’s durian time in Jakarta it isn’t durian time in Natuna and vice versa) so it may be worth trying to visit during the Jakarta rainy season. We’d love a bit more information on the history of the Natuna islands – how they came to be Dutch (presumably) rather than British prior to Indonesian. There aren’t a lot of decent online sources, not that I can find anyway.